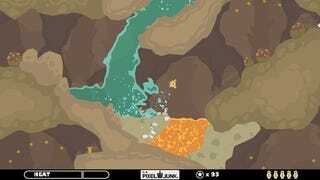 Christmas comes early to the PlayStation Network, as Q-Games fourth PixelJunk brand game, dubbed PixelJunk Shooter, burrows its way to the North American PlayStation next week. The December 10 update to the PlayStation Store will offer PixelJunk Shooter for an unannounced price. Here's to hoping that Shooter follows previous PixelJunk pricing at $9.99 USD or less. For hands-on impressions of Q-Games new game, read our most recent Tokyo Game Show impressions of the downloadable title.